Made from cast iron for high performance, abrasive resistance and long life. Designed with flat (machined) treads. 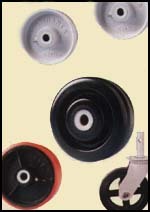 In many cases, these wheels will serve where steel or available iron wheels would otherwise be required.